Is Relaxation Dentistry Right for Me? A little anxiety before sitting down in the dentist’s chair is a natural feeling to have. But for some patients, that little bit of anxiety begins weeks before the appointment and only gets worse as the appointment grows closer. It may even grow to the point where the patient skips their appointment altogether, too nervous to go through with even a routine cleaning procedure! While many factors could cause this kind of fear, finding a solution for it is essential to ensuring you get the dental care you need to maintain a healthy mouth. Your Catonsville dentist is here to explain one possible solution: relaxation dentistry. Am I a Good Candidate for Relaxation Dentistry? If you have had a longstanding anxiety when it comes to your dental visits, then you may have already considered the possibility of relaxation dentistry. While this approach to dental appointments and procedures is not for everyone, it may be for you if you have a highly-developed fear of dentists or needles, if you have had a particularly traumatic dental experience in the past, if your teeth and gums are extremely sensitive, or if you do not react strongly to the local anesthetics sometimes used in dental procedures. What Does Relaxation Dentistry Entail? Relaxation dentistry is designed to help patients achieve a peaceful state of mind going in to their dental appointment. If you use this method, you will be given a pill to relax and after establishing your comfort level, your dental team will proceed as usual with your appointment. Relaxation dentistry not only eliminates discomfort during the procedure, but afterwards you will be able to leave the dental appointment with minimal discomfort as well. If you think that relaxation dentistry could be the right choice for you, call your Catonsville dentist today! If you have questions about relaxation dentistry, or it’s just been a while since you’ve had a cleaning or talked to your dentist, it’s time to make an appointment. You can contact Leikin & Baylin Dental Care of Catonsville, Maryland by calling 410-747-1115 or visiting CatonsvilleDentalCare.com. Are you afraid of going to the dentist? If so, you are not alone. Every year, millions of Americans avoid the dentist. Some had traumatic experiences as children. Others suffered pain as adults. And others were swayed by stereotypes. Whatever the reason, these individuals stopped seeking important dental care out of fear. Well, what if I told you that there was a simple solution to your problem? Imagine not being afraid to go to the dentist. Imagine being able to complete your dental care in one visit. Imagine having a positive feeling about your dental visit. Imagine being able to chew comfortably and smile confidently. This is what sedation dentistry specialists at Leikin & Baylin Dental Care are offering. Sedation Dentistry has been used safely for over 30 years, providing a relaxing and anxiety-free experience dental experience for patients just like you! On the day of your appointment, you will take a pill which will relax you. Our specially trained team members will ensure that you are comfortable and relaxed. During the dental visit you will be monitored closely. After your dental treatment is complete there will be minimal if any discomfort. Also, you will have little or no memory of your visit. Modern dentistry offers many new tools and options that make necessary treatments not only tolerable but even comfortable. If you have any questions about Sedation Dentistry or wish to schedule an appointment, please contact Leikin & Baylin Dental Care of Catonsville, Maryland by calling 410-747-1115 or visit CatonsvilleDentalCare.com. If you’ve avoided the dentist out of fear or if you’ve had a traumatic experience, sedation dentistry may be able to help. Imagine not being afraid to go to the dentist. Imagine being able to complete your dental care in one visit. Imagine having a positive feeling about your dental visit. Imagine being able to chew comfortably and smile confidently. With sedation dentistry, you don’t have to just imagine anymore. Sedation dentistry is now a reality at your local Catonsville, Maryland dentist. Oral relaxation dentistry proticolas have been used safely for over 30 years. Before starting any dental treatment, your medical history will be reviewed thoroughly. On the day of your appointment, you will take a pill which will relax you. Our specially trained team members will ensure that you are comfortable and relaxed. During the dental visit you will be monitored closely. After your dental treatment is complete there will be minimal if any discomfort. Also, you will have little or no memory of your visit. Minimal sedation – At this level of sedation, the patient is awake yet very relaxed. Moderate sedation – Slurring of words and little memory of the procedure are common at this level of sedation. Heavy sedation – A patient is at the edge of consciousness during this level of sedation, but can still be awakened if needed. General anesthesia – Under general anesthesia, the patient is completely unconscious. Anesthesia is safe for most dental patients. However, certain people, such as those who are obese or who have obstructive sleep apnea, should talk to their doctor before having sedation. That’s because they are more likely to develop complications from the anesthesia. 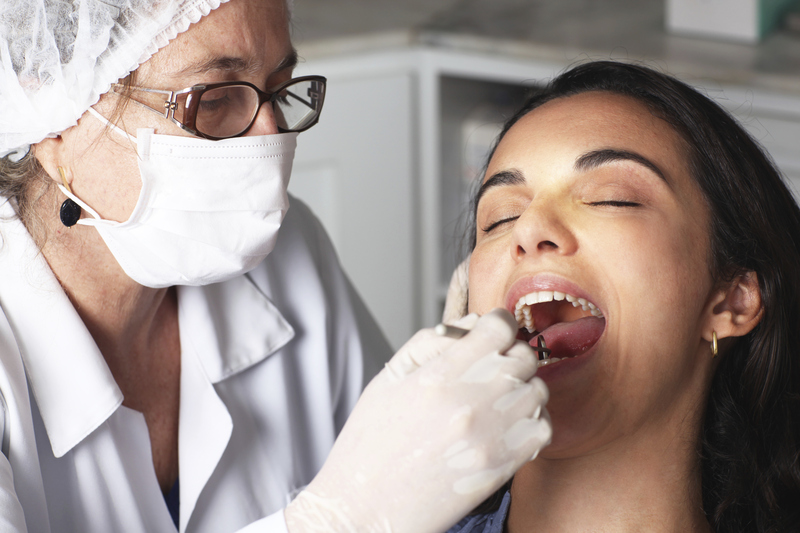 Your local Catonsville dentist will go over your medical history and any risks associated with the level of sedation dentistry you may require. Contact us today to inquire about sedation dentistry. Catonsville Dental Care makes visiting the Dentist Fun! If you have any questions about Sedation Dentistry or wish to schedule an appointment, please contact Leikin & Baylin Dental Care of Catonsville, Maryland by calling 410-747-1115 or visit CatonsvilleDentalCare.com. You can also follow us on Facebook, Twitter, and Google+.